Saint Joseph, the husband of the Blessed Virgin Mary, has several feast days. One of them is the Feast of Saint Joseph the Worker observed on May 1. It is an optional memorial in the Roman Catholic Calendar. However, it is considered a public holiday in Vatican City. The gospels describe Mary's husband as “tekton”. This word has been conventionally translated as “carpenter”, but it is in fact a common term for an artisan in general. 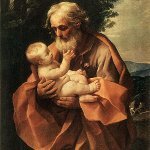 That is why Saint Joseph is venerated as a patron saint of working people and sometimes referred to as Joseph the Worker. The Feast of Joseph the Worker was established in 1955 by Pope Pius XII. It was intended to counteract May Day, which is celebrated as International Worker's Day (Labor Day) in many countries. Basically, Pius XII filled the already existing secular holiday with new religious meaning. Although the feast of Saint Joseph the Worker is an optional memorial, i.e. it has the lowest rank among feast days, it is a public holiday in Vatican City. It was made a public holiday to coincide with Labor Day in the rest of the world. On this day, Catholic reflect upon Joseph's hard work, persistence, patience and courage.